Many people think heart failure means the heart has suddenly stopped beating. Instead, heart failure means the heart has become weak and has trouble pumping oxygen and blood throughout the body. It is often called congestive heart failure because inefficient pumping can cause fluid to build up throughout the body, including the lungs, liver and gastrointestinal tract. Typically, it is a serious, long-term condition. 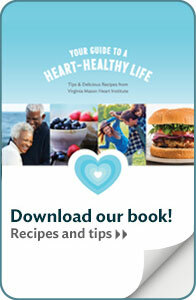 Millions of Americans are affected by heart failure, which causes about 300,000 deaths each year. Heart failure typically occurs after something weakens the heart muscle over time. While it is far more common among the elderly, young people who have had these types of injuries can have heart failure as well. Symptoms of heart failure include shortness of breath, fatigue, cough and waking up with a sense of panic. Blood flow backing up in the veins can cause swelling in the legs and abdomen. At the Virginia Mason Heart Institute in Seattle, treatment is first geared toward reducing symptoms to help you live a more comfortable life. Medications such as diuretics and Angiotensin-Converting Enzyme (ACE) inhibitors or Angiotensin Receptor Blockers (ARBs) help treat symptoms and improve exercise capacity. Other medications are used for slowing the progression of disease and improving heart muscle function. These include beta-blockers and aldosterone-blockers. The only cure for heart failure is a heart transplant. But heart failure can almost always be managed with appropriate medications or medical procedures. The Heart Failure Clinic at Virginia Mason is an integrated program that includes specially-trained cardiologists, electrophysiologists, nurses, pharmacists and a dietitian. Working together they provide comprehensive care, with attention to appropriate treatments and underlying causes of heart failure. If you have questions or would like to schedule an appointment in the Heart Failure Clinic, please call (206) 341-1111. Our staff will be happy to assist you.